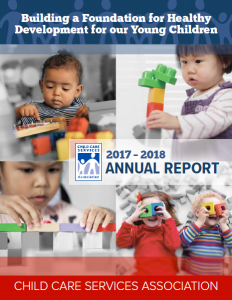 In many important ways, our preschool years determine our future competitive role in the global economy, the public safety of our communities, the cost-effective investment of public and private dollars, and the success of welfare reform. When child care becomes necessary for families, quality child care becomes critical for children. If done well, child care benefits us all. What do we mean when we say child care? Child care is the fee-based early education and care services a child receives in a center or home-based setting when not in the direct care of a parent. The safe, nurturing environment of quality child care may support a child’s need for early education, a parent’s need to work or attend school, or a child’s need for a healthy meal and protection resulting from a family crisis. Child Care Services Association (CCSA) works to ensure affordable, accessible, high quality child care for all families through research, services and advocacy. We are an association of groups, individuals and volunteers committed to supporting the right of young children and their families to have the best possible life. To do just that, CCSA provides free referral services to families seeking child care, financial assistance to families who cannot afford quality child care, technical assistance to child care businesses, and educational scholarships and salary supplements to child care professionals through the T.E.A.C.H. Early Childhood® and Child Care WAGE$® Projects. CCSA licenses its successful programs to states across the country and provides consultation to others addressing child care concerns. Headquartered in North Carolina’s Research Triangle region, CCSA is a leader and advocate in child care services on the local, state and national level. We collaborate with many partners, businesses and stakeholders to address needs within the child care system. We are only one part of the broader community’s commitment to create changes that helps every child. As we grow, we come closer to the day when all children, and their teachers, have the tools they need for success.